is on Tuesday this week. Blame it on the Summer Reading Program. busy busy. This week I found a wonderful nonfiction picture book from National Geographic on our library's new book shelves -- One World, One Day by Barbara Kerley. Washington, DC, 2009. In two double-page spreads we've seen the start of the school day for kids in India; USA; Guinea-Bissau; and Israel. (How do I know? I looked at the back matter where every photograph is identified and explained.) Once you reach the end of this beautifully photographed book, you've followed many, many children around the world to school and back again showing how different we are and yet how very much the same. The backmatter also includes a map of the world showing the home countries of the children shown in the book. I'm of two minds about this book. One-- It's a beautiful picture book -- beautifully written and illustrated with beautiful photographs -- and should be in the picture book section of libraries so that everyone can enjoy it. Two -- It's about children around the world and perfectly placed in the Dewey number of 305.2. Three -- I've gotta keep pulling it out from the 300s and put it on display. It will go perfectly in the 'back to school' display that I just put up. "One World, One Day uses exquisite, moving photographs and Barbara Kerley's poetic text to convey a simple yet profound concept: we are one global family. This is a sophisticated concept, presented as an elegant picture book with contributions from top international photographers. Through beautiful photographs, follow the course of one day in our world. Sunrise to sunset is captured in the essential things we all do daily, wherever we live in the world, and in the different ways we do them." (The rest of the Nonfiction Monday posts that were actually done yesterday (Monday) are at WrappedInFoil. 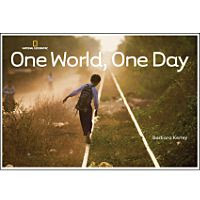 (added later) I just discovered that Barbara Kerley's book, One World, One Day, was selected by Indie Booksellers for the Summer 2009 Kids' List.